In the following guide, we aim to answer that question by offering an in-depth review of the best RV refrigerators currently on the market and a detailed analysis of what goes into the making of the ideal RV fridge for every type of RV. Let’s start off with our top picks of the best rv refrigerators per category for 2019. What Happens If You Use A Residential Refrigerator In Your RV? How To Install Your New RV Refrigerator? For the price, it’s hard to beat what you get with the Midea Compact. Finding a two-door refrigerator/freezer combo in a ‘mini’ fridge size is a tough task. This would be great for someone who spends 99% of their time camping with AC power, where the lack of LP gas or DC power supply is less of an issue. If you’re looking for an affordable, full-size refrigerator with the cooling power of a standard compressor, this may be your winner. We love the feeling of a full height refrigerator in an RV, which makes everything feel/seem more like home. Those of you with advanced solar power generation and an inverter can also run this while off-grid camping. Multi-power versatility is what you get with the SMAD Electric/Gas RV Refrigerator. The ability to run off of LP gas, AC, or DC power is a huge benefit to those who spend a lot of time away from shore power. This unit, due to its smaller size and no freezer, probably, makes the most sense for smaller camper vans or trucks at tailgates as opposed to full-time RV living. The performance of one of the leading brands in RV refrigerator manufacturing, Dometic, is evident with this portable refrigerator/freezer. Ideal for storing in the truck or outside of the camper for the ability to grab and go wherever your cooling needs take you. It can run connected to AC or DC power, or entirely on its own battery without any cords or connections. The speed at which the interior is cooled after turning it on is, also, impressive. This Whynter model is another great option for tailgaters, RVers, or boaters looking for the ability to bring their refrigerator anywhere. Unlike the Dometic above, it does rely on a corded power supply (either AC or DC), yet at less than half the cost it remains a serious contender. There are many factors that dictate the differences in design between, most, RV specific refrigerators and their residential counterparts. Not only are they smaller in size, accommodating for the limited space inside an RV, they must also allow for alternative methods of power. Unlike the refrigerator in your kitchen at home, It is common for those inside a camper to be without traditional shore power for long periods of time, whether during travel or when camping off-grid. Additionally, the components of residential refrigerators are, often, unable to withstand the constant vibrations and bumping experienced from a life on the road. Portable units are designed with fewer moving parts and more durable materials. In order to account for these demands, RV refrigerators use an entirely different method of cooling. Make sure to look for an absorption refrigerator in a portable unit, as opposed to a compressor version common in residential selections. An absorption refrigerator can cool itself via the burning of propane, without any need for electricity. This is a significant advantage for use inside of an RV or other situations where portability is important. Envision a system of pipes within the rear of your refrigerator that contains an anhydrous liquid ammonia. The heat generated from a small, pilot flame (burning propane) evaporates this ammonia through these tubes. Upon mixing with water, the ammonia condenses and pulls heat from the interior space surrounding it. Higher end RV refrigerators will, often, have 2-way power supply options. When connected to traditional power, the heat is provided by an electric resistor. When disconnected from AC power supply, however, it will then operate via an LP propane tank. On the other hand driving with it ON is not the safest. Ultimately, this is what keeps your food at the proper temperature after you disconnect from the power box at one campsite, and begin traveling towards another. The refrigerator styles used most commonly in motorhomes, travel trailers, and conversion vans can be summarized into three main categories. The space available within your RV, the number of groceries you plan to store at any one time, and the degree of portability you desire will help determine which is best for you. Big enough that you wouldn’t want to move them frequently, yet small enough to fit in the narrow spaces, often, found within campers, stand-alone refrigerators are a great choice for many RV owners. This style of refrigerator doesn’t require any special water hose connections or permanent installation mounts. The fact that you can, simply, plug them in and stand them wherever they fit within your space makes them popular for dorm rooms, apartments, in addition to campers. If you’ve got the space, why not bring the comforts of your home kitchen into your RV? A combination refrigerator/freezer gives you maximum food storage options without the need to decide whether you’d prefer them freezing or refrigerating. With separate compartments maintained at the proper temperature, you’ve got both. These refrigerators most closely resemble the ice chests you see people taking to the beach, park, and the pool during summer. They are small in size but allow you the freedom to bring your cold drinks and snacks to wherever you end up. 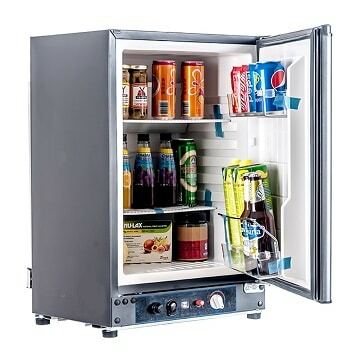 Unlike the camping coolers above, which require constant ice to keep the interior cold, portable RV refrigerators feature electric or battery powered compressors that eliminate the need to fill valuable interior space with ice. Being that these are a popular first option for people on the go or in an RV, we’ve summarized some of the key benefits and disadvantages below. The apocalypse will arrive to destroy us all. Okay, that might be a bit dramatic but there are, indeed, some key problems that you should be aware of if you choose to install a residential refrigerator in your RV. 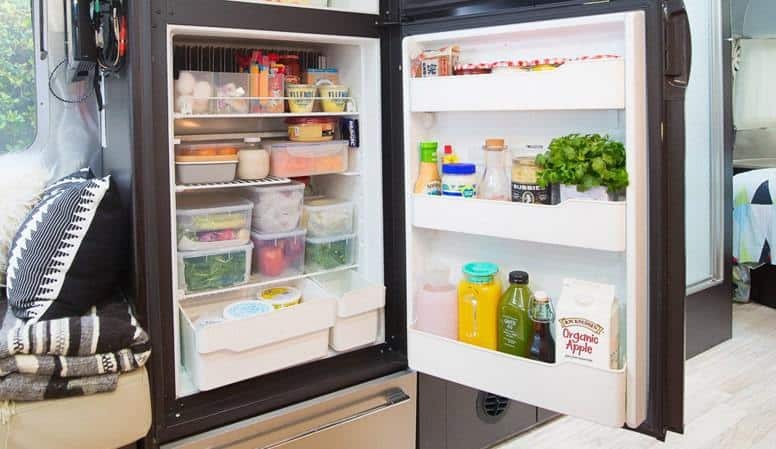 Residential refrigerators are bigger than those designed for portable or RV use. This may appeal to full-time travelers or those with big families, however, they should remember that finding cabinet space in an RV kitchen can be challenging. If the camper was originally designed with an RV fridge, your residential replacement may not fit into the designated cut out space. Accommodating your RV’s kitchen to work with a residential fridge may require expensive carpentry and cabinet modifications. One of the biggest disadvantages in using a residential refrigerator on the road, in your camper, is the fact that they are only capable of running off of 110V AC power. This isn’t a problem when you are plugged into a site’s electrical box, but it won’t help you when camping off-grid or keeping items cool while traveling. In order to operate with the power supplied by your RV’s battery (a popular solution for power while on the road), you will need to purchase and install an inverter with your refrigerator that converts the 12V battery supplied power into the 110V that it needs. You should, also, consider the greater power requirements of a residential refrigerator before installing one into your RV. If you utilize a solar-powered system for your off-grid camping, there is a strong possibility that it will not be able to handle the needs of a residential refrigerator, which is known to be a power hog amongst other electrical appliances. Residential refrigerators are not designed to handle the consistent vibrations, bumps, and unexpected jolts that take place when a camper is barreling down the highway at 65 mph. Internal components, while lighter than those seen within an RV refrigerator, are more prone to failure when used in this manner. There are, obviously, an infinite number of ways that you can take advantage of having a refrigerator with you when you travel. Leftovers – One of our favorite parts about visiting new places is to enjoy the local cuisine. Now that you have a fridge, you’ll never use the phrase, “sorry, we can’t take it with us because we’re camping” again. 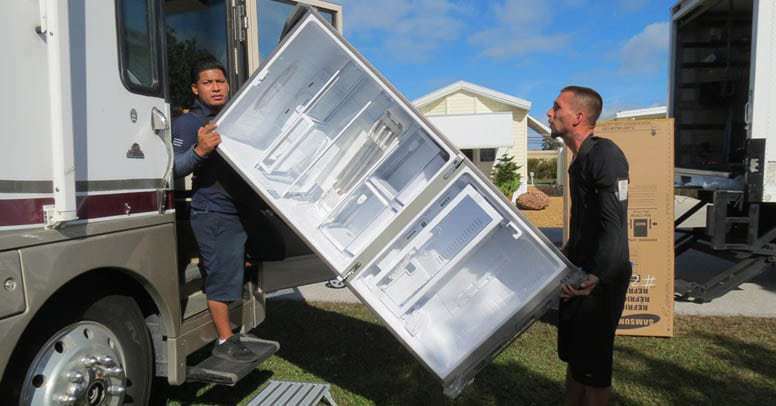 Before getting started with the necessary steps required to, safely, install your replacement RV refrigerator, consider whether you are, truly, the best person for the job. Removing an existing refrigerator and installing a new one is considered a moderately difficult process by most experienced RV technicians. While those who are confident in their skillset will be able to handle the removal/install on their own (or at least with a friend who you’ve convinced to help load and unload two refrigerators), several precautions will need to be taken. You will be disconnecting the hardwired power supply and liquid petroleum (LP) gas lines that run to your existing refrigerator. There are serious repercussions if this is not done correctly or if you forget to shut off certain valves before disconnecting. If you don’t feel ready to tackle this project on your own, please take your RV to a local, knowledgeable RV repair shop that can manage the install for you. Sometimes, the peace of mind delivered by a professional install will be well worth the additional investment it will require. Determine whether the old RV refrigerator will fit through the doorway (some fridge installations were down before rv wall panel and doors were built). If not, you might have to remove a large window or windshield in order to remove the old fridge. Make sure you have worked with your new RV refrigerator manufacturer to ensure that you have measured correctly and have purchased the proper size for your cabinet cut out. Regular cleaning of your refrigerator’s exterior and interior is a great way to extend its life. It, also, helps to limit the amount of food waste and contamination that can develop from dirty conditions or spills that spread liquids onto other items. Take a look below at our recommended cleaning steps to keep your RV refrigerator in pristine shape. This is, largely, the determining factor for what type of RV refrigerator will work best for you. Are you looking to add a refrigerator to your small, camper van, or are you looking to replace one in a motorhome that already has cabinet space cut out for it? Remember to factor in your RV slideouts when deciding where to place your refrigerator. We, also, recommend placing your refrigerator in a position where you won’t need to move it for every trip or each time you retract the slideouts. If you frequently set out for weeks at a time in your RV or are considering full-time RV living, where consistent eating out is financially unrealistic, make sure you look for a dual freezer/refrigerator large enough to handle your daily dietary needs. Try to avoid the situation where you end up needing to supplement your main refrigerator with multiple portable units. Not only does that strategy take up unnecessary space within your RV, it makes grocery organization a challenge (searching through 3 refrigerators or coolers for ketchup is not fun). Conversely, if you seldom camp for more than 2 nights on a weekend, then you may benefit more from a smaller, stand-alone refrigerator or a portable unit that gives you a few options for food and drinks without occupying much space. Considering the areas that you prefer to camp and their accompanying power supply options will help clarify which RV refrigerator will work best for you. For example, if you seldom camp without access to an electrical box and AC shore power, then you might be able to get away with a larger fridge that takes more power. Additionally, you wouldn’t need to be as concerned with the 2-way and 3-way operation modes of many high-end RV refrigerators (since you would seldom need LP gas or DC power). Alternatively, if you find yourself, regularly, camping off-grid or at sites that don’t offer electrical hookups, then you might do better with a smaller, more energy efficient fridge. You’ll, also, need to think more about power supply and whether your power generation methods (solar, battery, etc.) are capable of handling a refrigerator running 24 hours a day. A 3-way rv fridge will, likely, be a lot more versatile in this situation. Knowing how you plan to power your new RV refrigerator is one of the most important aspects to purchasing a new one. Residential refrigerators are more efficient at cooling, however, they require power loads not suitable for most camping situations where you may not have shore power. Instead, look for 2-way or 3-way models that run off of LP gas or DC power while you are traveling or when you are without access to AC power. These models will cost more and require a bit longer to cool, but they are specifically designed for mobile use and give you maximum flexibility for the many environments in which you camp. How Many People Are You Feeding When You Camp? RVers who travel with their family and friends will, naturally, benefit from a larger refrigerator to accommodate their increased grocery needs. If you travel solo, a smaller stand-alone fridge may save you money (less propane) and space. Do You Like To Cook While Camping? Some folks consider cooking a gourmet meal for their family and friends during an RV trip as a big part of the fun. Others are just as happy eating out, or eating more traditional, simple camping meals. Knowing which of the two you are will help dictate what size capacity cooler will keep you, and your hungry guests, happy. Ultimately, you’ll discover that an RV refrigerator can be an integral part of feeling at home on the road, regardless of which model you decide is best for you. Life on the road can be expensive and having the ability to store your own, fresh food can save thousands of dollars over the course of many trips. With the combination of increased comfort and cost savings, incorporating a best possible RV refrigerator into your travel lifestyle may be just what you need to keep the adventure going.